Waterbury is a city in the U.S state of Connecticut. The settlement was found in 1674 and till 1686, it was a part of Farmington. Earlier known as Mattatuck, it adopted its present name after it was incorporated as a town in 1686. 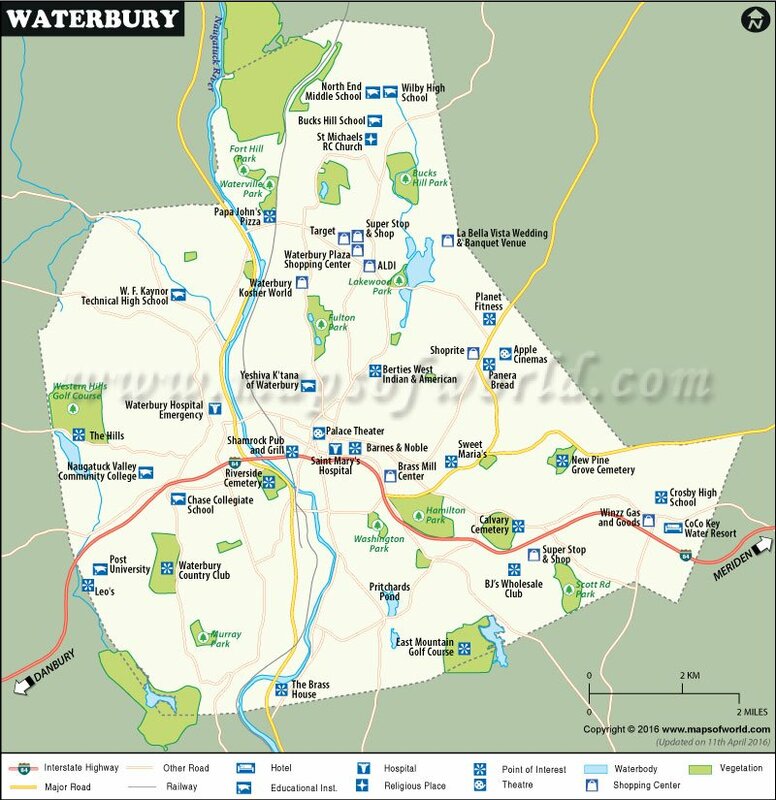 Later in 1853, Waterbury was incorporated into a city and in 1900 the town and the city of Waterbury were united into one municipality. Waterbury, a city in New Haven County then became the leading center of brassware, watches and clock and got the title 'the Brass City'. Waterbury hotels that offer outstanding services to its customers are often visited by tourists to spend their nights. The wonderful location of these hotels provides an opportunity for its guests to have a spectacular view of the city from its windows. Hampton Inn, Courtyard Downtown, Holiday Inn Express, Connecticut Grand Hotel, Howard Johnson Inn, Paramount Hotel, Red Bull Motor Inn and Waterbury Super 8 Motel are the hotels in the city that provide world-class reception to its guests. This city incorporates amazing range of shopping malls equipped with latest fashionable amenities and restaurants. These alluring Shopping Malls serve travelers to discover every variety of choice for commodity as well as foodstuff. The range of reputed shopping plazas and malls including &apos;Brass Mill Center Mill', 'Waterbury Plaza' and 'Fair-Oaks Plaza' have made the city a dream destination for shopping to the travelers and one of the most fascinating hubs for vacation as well. Soldier's Monument : This memorial is reputed as a memorial of the civil war catastrophe. This unique monument is designed with meticulously engraved sculptures. The Horse on the Green : This is widely known as &apos;Carrie Welton Memorial Fountain' and was constructed as the memorial of horse knight. St.John's Episcopal Church : Built in year of 1873 this old church epitomizes Gothic English Revival pattern of architecture. Clock Tower : Patterned after Italian marvelous tower named &apos;Torre Del Mangia' this amazing Clock Tower was inaugurated in year 1909. Mattatuck Museum : This Museum is proclaimed as Waterbury's exclusive museum, which focuses on the historical affairs, art and culture of Connecticut. Benjamin Franklin Statue : This Wonderful statue with seating posture by well-known sculpturer Paul Wayland Bartlett.